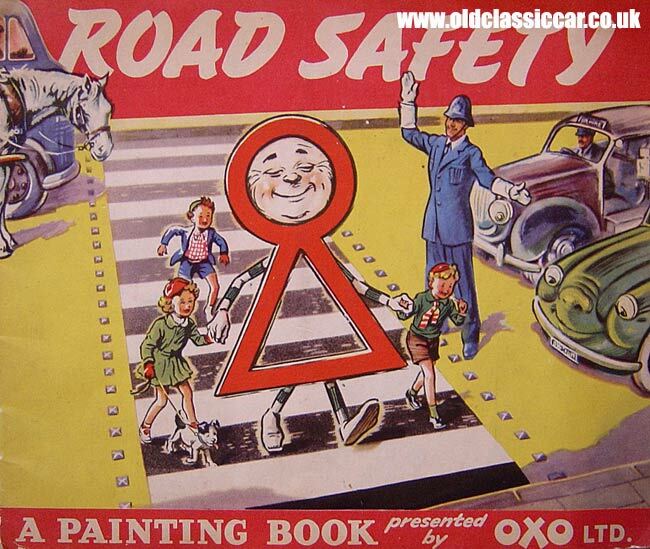 OXO Road Safety children's painting book 1950s. Homepage. This page: Rare colouring book designed to teach children about dangers on the road . The colouring and artwork in this slim booklet caught my eye in an old-book shop. Although un-dated, I'd think that it was printed in the 1950s. Interestingly it was produced by the OXO company, better known for their gravy rather than road safety campaigning I'd have thought. The main character is the chap shown on the cover, called 'Road Safety' conveniently, seen escorting some children across a pedestrian crossing, assisted by a traffic officer. Throughout the booklet there are lovely old drawings showing typical road situations that children could find themselves in, with advice on what to do, and what not to do. Each page has a particular piece of advice, and a coloured illustration. Alongside is an un-coloured version, for the child to colour in for themselves. All the vehicles (cars, lorries, coaches and motorcycles) have 'faces', not unlike those seen in the Thomas The Tank Engine stories. Areas of road safety covered include the kerb drill, tips on crossing the road correctly, not playing in the road (I can think of some brats who we used to live near that could do with reading that page!! ), how to walk on roads that have no pavement, getting on and off the bus, not hanging off the back of moving lorries, when to cycle in single file only & how to give clear signals, keeping your dog under control when near a road, and raising awareness of the Highway Code and common road signs. All in all its a great little colouring booklet, and looking at it now some 50+ years later it is packed with lovely old illustrations, packed with vintage vehicles, road signs and other street furniture that have all but disappeared now. I don't know if OXO still produce these painting/guide books, but hats off to them for doing it back then. A very similar type of publication, titled "The Children's ABC of Road Safety" from the 1940s, can be found here.